Enviro-Stories to work with 10 schools in our region, to write a Biodiversity-themed short story focusing on local threatened species and what can be done to save them from extinction. Students can explore and discover environmental threats including feral animals, weeds, habitat loss and fragmentation, and stock grazing bushland. So just what is a Hotspot Hero? A Hotspot Hero is someone who is willing to stand up and take action to help prevent our threatened plants and animals from fading into oblivion. Global ‘Biodiversity hotspots’ are geographic regions that are extremely rich in species diversity (plant and animal life), yet are threatened with extinction. 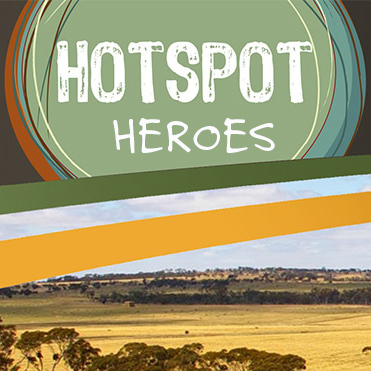 The word ‘hotspot’ is linked to the Avon River Basin forming part of The South West Australia Ecoregion (SWAE). This is Australia’s only Global Biodiversity Hotspot, and is home to a variety of unique flora and fauna which are under serious threat. In fact, this region has the highest concentration of rare and endangered species in Australia. The region stretches from Shark Bay in the North to Esperance in the south, covering 48.9million ha of land, which includes the Avon River Basin. The importance of the South West Australia Biodiversity Hotspot is recognised by the Australian Government with 3 out of 15 National Biodiversity Hotspots located In the South West Australia Ecoregion. One of these, the Central and Eastern Avon Wheatbelt (Western Australia), forms part our region. With as much as 94% of the regions vegetation cleared, and an increasing number of ferals, much of the remaining woodlands containing many of Western Australia's threatened plants and animals are at risk of extinction. It is home to many different animals, birds and fungi species, many of which are endemic (7 species of mammals, 13 species of birds, 34 species of reptiles and 28 species of frogs). What can we do to help our biodiversity? The aim of this book is to promote awareness of the biology, ecology, threats and management of mammals that have occurred in the Avon region since European settlement. The Avon region is located within the central and eastern wheatbelt of south-western Australia. The Avon region comprises a total area of almost 120 square kilometres. Qweerk the frog and his native animal friends were very upset about the Feral Fox that had moved in. The animals decide to have a meeting with Man to see if they can help them. Arguments start but you’ll have to read the book to see how they sort it out. Chuditch the native cat was irritated. Someone had been hunting the native animals and he was sure he knew who the culprits were. Chuditch calls in all the bush animals to find out what can be done. Haley and Stripes the Malleefowls are desperate to protect their mound, with its precious eggs inside, from Farmer Todd who plans on clearing the land for his sheep. How can a Malleefowl alert a farmer to its presence? Find out in this great little book. In the hide of Duck Rocks amongst the silver-leafed Salmon gums, lay Fuzzy the Red-tailed phascogale in his hollow. He was having a lovely day before tragedy hit! A bushfire was heading his way. He has to escape but as he does, he runs into more trouble. My name is Rania. I am a Red-tailed Phascogale. Sometimes it is hard being a phascogale as there are many things that threaten us. This is my story about survival. In the small, quiet, peaceful, friendly Western Australia town of Pingrup there lived four farmers who all had one thing in common – RABBITS! Each farmer tries a different technique on trying to get rid of the rabbits. Some succeed, one fails. Wheatbelt NRM is collaborating with Enviro-Stories to work with 10 schools in our region, to write a Biodiversity-themed short story focusing on local threatened species and what can be done to save them from extinction.